No more weight or bulk constraints: You can cart a whole bunch of e-books around when you travel on your iPad, iPhone, or MacBook Air or Pro without breaking your back. Feel like reading a trashy novel? Go for it. Rather immerse yourself in classic literature? Go for that. You might read a textbook, cookbook, or biography. Flexible fonts and type sizes: With e-books you can change the text size and fonts on the fly — quite useful for people with less than 20/20 vision. Get the meaning of a word on the spot: No more searching for a physical dictionary. You can look up an unfamiliar word on the spot. Search with ease: Need to do research on a particular subject? Enter a search term to find each and every mention of the subject in the book you’re reading. Read in the dark: Your Mac has a high-resolution backlit display so that you can read without a lamp nearby, which is useful in bed when your partner is trying to sleep. See all the artwork in color: Experience stunning artwork that was once the exclusive province of big, expensive coffee-table books. Believe it or not, prior to Mavericks there was no way for you to read an iBook on your Mac. While the iBooks app has been available on iDevices for years, Mavericks marks its first release on the Mac. 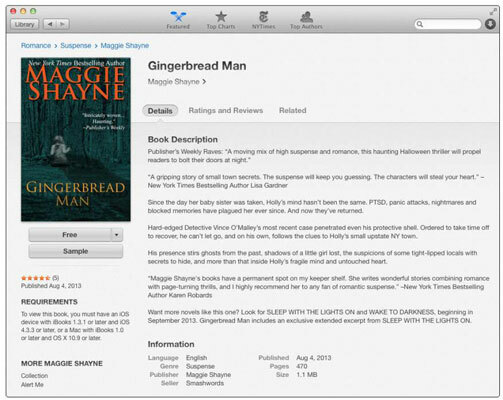 Now click the Store button in the upper-left corner of the iBooks window. If you think the iBooks Store looks suspiciously like the iTunes Store, you’re right. 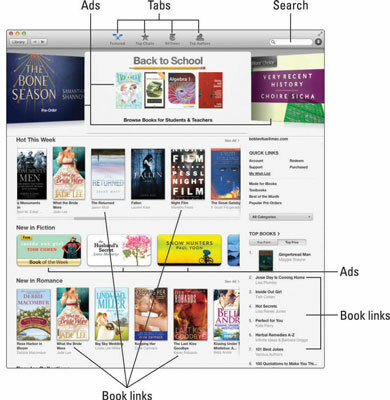 Until Mavericks was released, Mac users had to shop for iBooks in the iTunes Store using iTunes. You couldn’t use iTunes to read iBooks, mind you, but you could buy them like crazy with iTunes. Now, in Mavericks, you can buy and read iBooks using the iBooks app on your Mac! If you have purchased iBooks with iTunes, they should automatically appear in your iBooks Library. If you don’t see them in iBooks, choose File→Migrate from iTunes (Command+Shift+M), and in a minute or two you will (see them). Most books offer a free sample, a chapter or chapters you can download for free. Click the Sample button and a sample will appear in your iBooks Library within a few minutes. iBooks can also handle books you acquire elsewhere, and it supports a technical standard called ePub, a format that offers hundreds of thousands of free and public domain books on the web. Google Play: Not all the books here are free, and Google has a downloadable app. Choose File→Add to Library and then select the ePub file and click Add. Drag the ePub file onto your iBooks Library. To start reading a book, double-click it and it leaps off the shelf, and at the same time, it opens to either the beginning of the book or the place where you left off, even if you left off reading on another device — an iPhone, iPod touch, iPad, or another Mac. 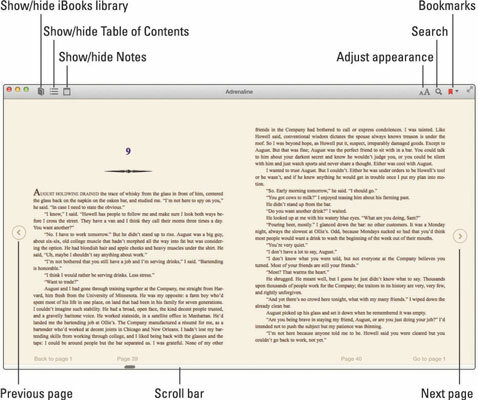 Here’s how to actually read an iBook: To go to the next page, click in the right margin or press the right arrow key. To go to the previous page, click in the left margin or press the left arrow key. Click the Table of Contents button to jump to a specific chapter. To jump to a specific page, move the cursor to the bottom of the iBooks window to make the scroll bar appear; then drag the scroll indicator left or right to move forward or back in your book. The current page number appears in a balloon below the scroll bar. To make the text bigger or smaller, click the Adjust Appearance button near the upper-right corner of the screen, and then click the uppercase A to make the type larger or the lowercase a to make it smaller. If you want to change the font typeface, click the Adjust Appearance button and select the font style you want to switch to. Your choices at this time are Original (the default), Athelas, Charter, Georgia, Iowan, Palatino, Seravek, and Times New Roman. A check mark indicates the currently selected font style. To change the page color, click White (the default), Sepia, or Night. To listen instead of reading, click at the spot you want to begin from or select the text you want to hear. Now, choose Edit→Speech→Start Speaking and in a few seconds a robotic voice will begin reading you the story. To stop, simply choose Edit→Speech→Stop Speaking.